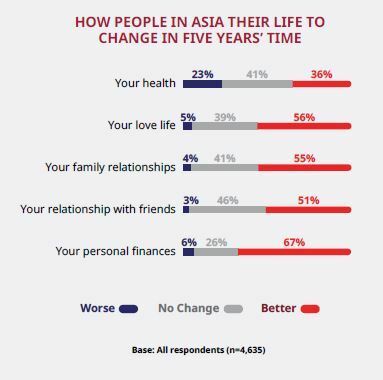 Given the importance of relationships to happiness, well-being, and longevity, a new report offers insight into relationships in Asia; and how we can make them stronger, better and more rewarding. Cambodia ranks first out of nine markets in Asia, with a score of 86/100, in the second edition of the Prudential Relationship Index (PRI), indicating that a person’s primary relationships deliver 86% of what they want from that relationship. Malaysia, Hong Kong, and Singapore rank sixth, seventh, and eighth respectively – beaten by Vietnam, Philippines, Indonesia, and Thailand rounding up the top five slots. 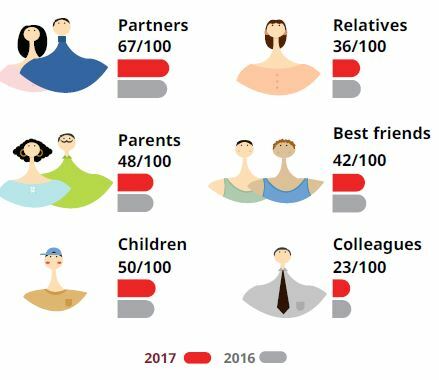 Overall, across the nine markets, the average relationship score for friends is 42/100 and colleagues is 23/100. 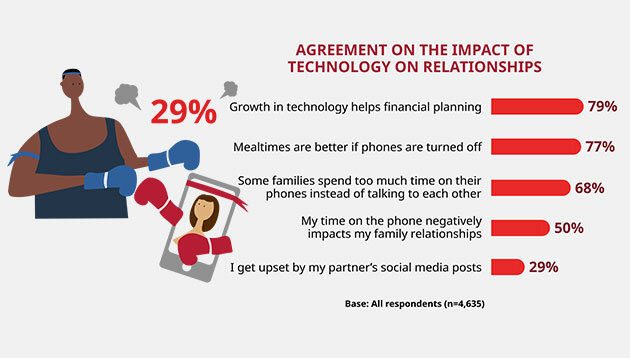 Measuring views from 4,600 respondents, the report measured various aspects of relationships that can be mapped on factors building better working environments, shared below. Saving enough for future retirement (50%) is the highest-ranking financial goal in most markets across Asia, while travelling with family (47%) comes in second. Malaysia (61%) has the largest regional proportion of people saying that saving for retirement is a key financial goal, followed closely by Vietnam (60%). For Cambodia and the Philippines, the top-ranking financial goals differ – with 82% of Cambodians prioritising a flat or house, while 59% of Filipinos hoping to start a new business. Supporting the children’s education is another top goal, particularly in Cambodia (82%), Indonesia (60%) and Vietnam (59%). Despite their general concern about the future, on average, only 23% of people in Asia say saving for emergency needs is a high-ranking financial goal. Will I have enough $$$ for retirement? 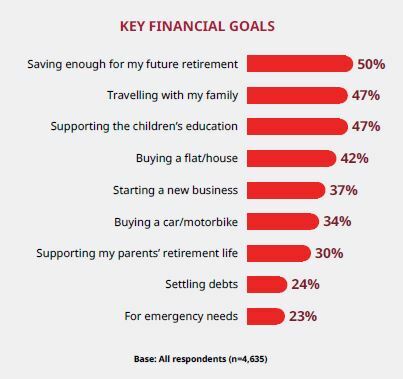 Saving for retirement is a top financial goal for the majority of people in Asia, with 58% admitting that they worry about saving enough money for their future retirement. 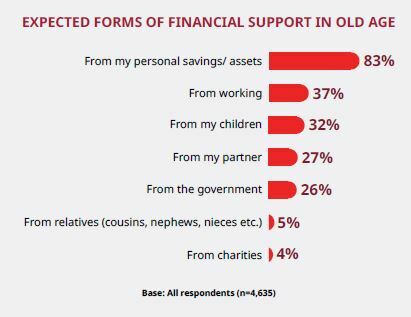 46% of people in the region are not confident about saving enough money to support themselves until the age of 80. Filipinos worry the most across all markets – 75% expressed concerns about retirement funds. People in China are the least worried in the region regarding their future retirement. Only 22% say they are not confident about having enough money to live until the age of 80. In Thailand, 48% of people expect the government to financially support them in their old age – the highest regional proportion. 77% of people in Asia agree that mealtimes would be better if everyone turned off their phones. 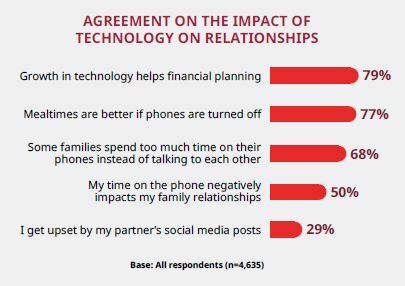 Half of people in the region believe that time spent on the phone has a negative impact on their relationships with family. The Philippines (90%), Malaysia (85%) and Singapore (85%) have the highest proportions of people saying that if phones were turned off, mealtimes would improve. More than two-thirds (68%) of people also believe that some families spend too much time on the phone rather than talking to each other. Overall, in developed markets people are more likely to opt for shorter working hours for more free time, compared to emerging markets, where longer hours are preferred in order to earn more. People in Singapore (55%), China (48%) and Hong Kong (45%) are more likely to choose shorter working hours for more free time, even though this means they earn less money. Emerging markets such as Cambodia (95%), Vietnam (85%) and Thailand (80%) prefer working longer hours for more money. In general, however, 65% of people across all markets surveyed in 2017 say they would work longer hours for more money. The firm will provide each worker with three days of paid leave, return air tickets, as well as RM300 allowance. ..
Help your staff push through a sluggish afternoon with these tips, which include calling loved ones, checking Facebook and - weird..